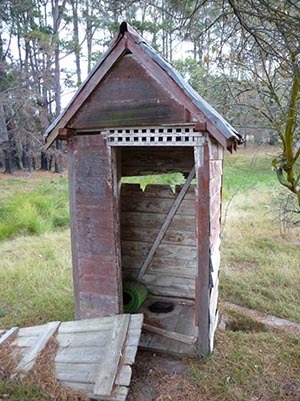 A rustic outside toilet (no longer in use). There are two types of wastewater - greywater and blackwater. Greywater is household water from baths, showers, hand basins and washing machines that does not include toilet discharge. Blackwater is from toilets. Wastewater from your kitchen sink is also treated as blackwater in onsite wastewater systems, because it can be highly contaminated with food particles, cooking oil and grease. Although greywater has a lower level of contamination risk, it can cause health issues if it is not treated to an adequate level if you want to reuse it for toilet flushing, clothes washing or watering the garden. Systems are available that only treat greywater. For owners of properties not connected to town sewers, installing a greywater system does not remove the need to treat blackwater from the toilet and kitchen. Often the costs of installing both greywater and blackwater treatments systems can be more than the cost of one system that would deal with both. The term 'wastewater' refers to both greywater (from baths, showers and washing machines) and blackwater (from toilets). While 'effluent' refers to this wastewater after it has been treated. WaterNSW recommends that on properties not connected to the town sewer in the Sydney drinking water catchment, greywater is treated with blackwater wherever possible. improves the quality of water flowing into the water supply dams.